I haven't updated this blog in a very long time. I actually deleted a ton of posts while I was applying for social security disability. 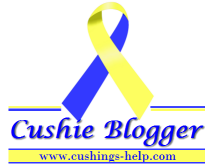 I posted about Cushing's Awareness day earlier this week on facebook, so I guess I'm in a sharing mood. Anyway, for anyone who even reads this, I was watching a documentary on Netflix about a teenager with anorexia and mental illness who found meaning in her life through yoga. (It's called I Am Maris). It's kind of the reason for this post. To start - let's go back to June 2018. My grandmother died. She lived a wonderful long life, but it was especially hard on me. She was the reason I got out of bed every day, my best friend, and so much more. I actually don't remember how I got through most of the summer. Happy 2018! I hope this year is a good one for everyone. 2017 was not the best year for me, and it seems like a lot of people relate to that, either for personal reasons or global ones. 2017 started off with me being in the second month of unemployment. I had just been denied social security disability for the first time this go around, and was feeling sicker than ever. Over the last year, I've faced more challenges than I ever thought I could, and somehow made it to where I am today. In 2018, I'm looking forward to finally being approved for disability. I am also looking forward to some resolved health issues, or at least next steps in figuring out what is wrong. I hope 2018 is a happy and (relatively) healthy year.